I like that for whatever reason, Hastings is becoming a big enough store, that they are getting various variants now. If it wasn’t for our local Hastings, I wouldn’t be able to buy comics at all here. Not too sure why they went with Wolverine and Jean for this. Those two have spent like no real time together. 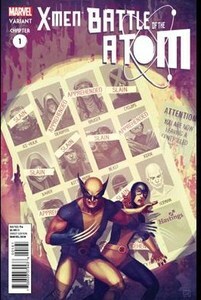 I suppose they didn’t want two women on the cover, and Wolverine was on the original. Jean Grey is the driving force behind this storyline. Of the Original Five, she is the one with the most to lose, as of the five, she is the only one not currently alive. I like how Kitty is on the poster side of the homage, and twice! That is pretty cool.